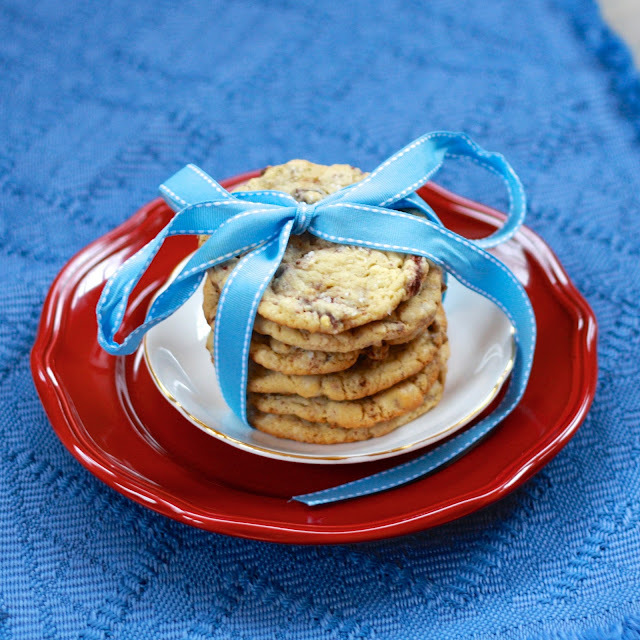 These cookies are wrapped up in a ribbon because they are good enough to gift! I really loved the soft and chewy chocolate chip cookies I made a few months ago, but was anxious to find a version that had that texture but used all butter, instead of shortening. Behold--Bon Appetit made it happen! I was intrigued by the recipe, which includes not one but two egg yolks in addition to an egg, and also includes a small amount of powdered sugar. I'm not sure if it's one of these changes from the typical chocolate chip cookie recipe that created such magic, but I plan to use this base for my cookies from now on! I'm already dreaming up all sorts of mix-ins to try. That being said, the classic chocolate chip (or chocolate chunk, really) was a winner! I used some two Ghirardelli dark chocolate bars that included toffee and almonds, but you can use whatever chocolate you wish. The recipe only makes twenty-four cookies and they didn't last more than twenty-four hours (we shared with friends--we're cookie monsters, but not THAT much!). 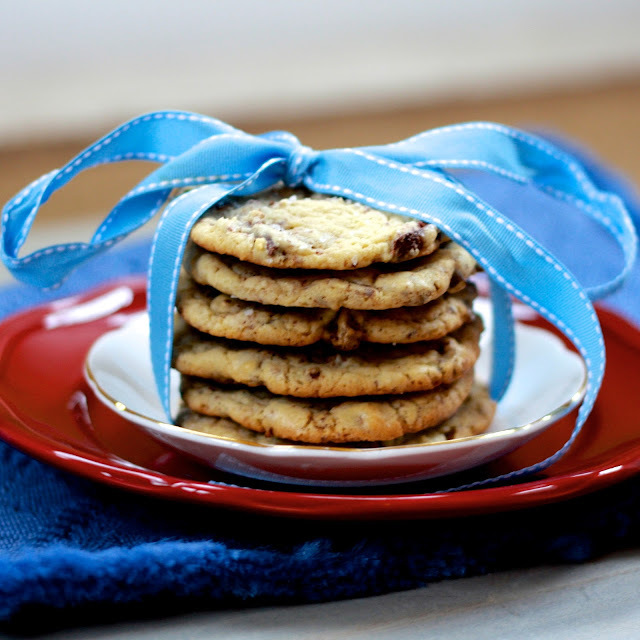 Don't skip out on the sea salt--it makes the cookie! 1. Place racks in upper and lower thirds of oven. Preheat oven to 375F. In a large bowl, whisk together flour, baking powder, kosher salt, and baking soda. Set aside. 2. Beat butter with brown sugar, sugar, and powdered sugar for 3-4 minutes, until light and fluffy. Add egg yolks, egg, and vanilla and beat for an additional 4-5 minutes, scraping down the sides as needed. 3. With mixer on low, add dry ingredients, beating just until combined. Use a spatula to fold in chocolate. 4. Spoon rounded tablespoonfuls of cookie dough onto 2 baking sheets lined with parchment paper. Leave 1 inch between cookies. Sprinkle cookies with sea salt. 5. Bake cookies for 10-12 minutes, rotating pans halfway through, just until golden brown on the edges. Allow cookies to cool slightly on baking sheets before transferring to wire racks to cool completely.